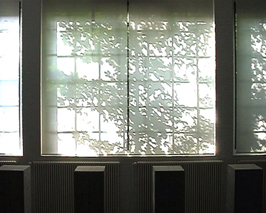 In a series of 14 interior takes, we see automatic shades slowly rising. While closed, the light is muted, there are shadows of trees swaying gently in front of the windows outside. Gradually the “screens” begin to rise, the image becomes vibrant, what is outside comes into view. We hear birds, the scraping of feet, the sound of trains. This DV is an indirect homage to the experience of cinema, to the film “Wavelength” by Michael Snow, and our relation to the inner and outer world. 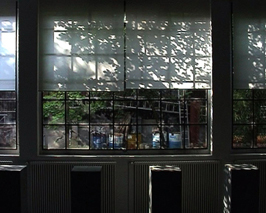 Padgett has described her video, “ambient noise” (2004) as an homage to the experience of cinema and to Michael Snow’s film “Wavelength”. Like Snow, she uses a static camera . 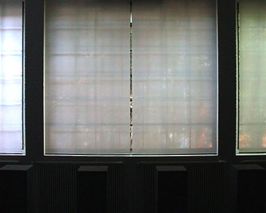 The camera looks toward the end of the room where the automatic window shades repeat their movement as they open, to become a moving screen. 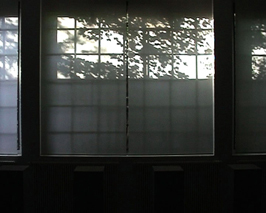 Filmed in fourteen fragments of time during morning light, it lifts a screen to show what is outside but an outside already registered on its surface, through the light that filters the shadows. Unlike “Wavelength” there is no zoom, only the movement of the blinds and the editing. .. [opening up] a distance that allows a proximity to the “mysteries of the common hallucination of representation”.